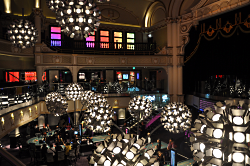 Father and son team Jimmy and Simon Thomas have invested more than £40 million transforming the former Hippodrome Theatre in Leicester Square, London, into a high-end, opulent casino, blending theatrical history with contemporary, luxurious furnishings. The complex comprises three floors of gaming with the main gaming floor based in the original 60-foot theatre atrium, but what really sets this venue apart is its other facilities; a 180-seat cabaret theatre, an impressive restaurant, four private dining rooms, five bars and a number of lounges and events spaces. Audica Professional MICROseries have provided a number of unique solutions for the outstanding audio installation, designed and installed by Willow SoundVision, a specialist integrator of audio visual systems and digital media solutions. With around 40 networked zones, every audio product was carefully selected to be the best solution for the building and the multi-purpose way it is used. In the main casino area, Audica Professional loudspeakers provide a unique architectural solution alongside the Community main system. 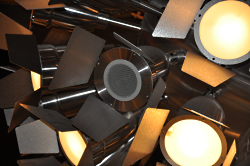 Creating intimate audio for the gaming tables, Audica MICROdot loudspeakers are built in to the stunning giant 'Dandelion Clock' light structures which provide the aesthetic near-field lighting of the tables. The dandelions are formed using clusters of spotlights, with MICROdots intermittently taking the place of spotlights. The effect of the dandelions is not only visually striking, but places light and sound exactly at the proximity and level it's needed. 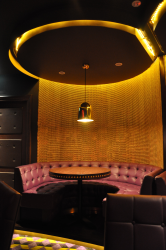 Slim Audica MICROlines are installed around the main casino bar, merging perfectly with the available space and aesthetic lines of the bar's design. Again this places them close to people using the bar, providing just the right ambience and sound level required. 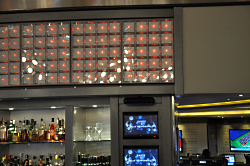 Audica MICROzone amplifier/controllers and MICROplus 4-channel power amplifiers provide the processing and power for the Audica loudspeakers in the main casino and bar areas. The Matcham Room is an intimate 180-seat cabaret theatre, located behind the original Hippodrome stage, which fronts the main gaming floor. To meet the standards of the world-class performers the venue attracts, the front-of-house is a Clair Bros constant curvature array system. Around the edge of the Matcham Room are private booths, each of which uses two Audica MICROdot ceiling loudspeakers mounted in the booth canopy, providing high quality near-field sound.